Fireco has been the trustworthy brand and product in Fire Rescue & Emergency application. 4 major products of Fireco have been well known and continuously used in this industry. Pneumatic Telescopic Floodlight is the essential equipment for Night Rescue Operation, as it is important to have sufficient brightness for rescue team to carry out rescue work. Fireco provides complete solution of Pneumatic Telescopic Mast with variety types of Floodlight to fullfill customer’s requirement. It can be in mobility (mounted on vehicle or trailer) and portability (able to hand carry and set up easily). Fireco Water Mist Kit is used in rapid fire fighting for the rescue team to be able to rapidly reach the fire scene and start the fire fighting first. Water Mist is the great choice to assist in extinguishing fire efficiently, with lesser water consumption. 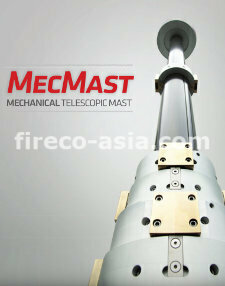 Aquamast, a Fireco Pneumatic Telescopic Mast that deliver water while extending the Mast to assist rescue team in extinguishing fire for tall building and hard to reach area. Aquamast coupled with water monitor is becoming essential for rescue team to extinguish fire at the safest point. 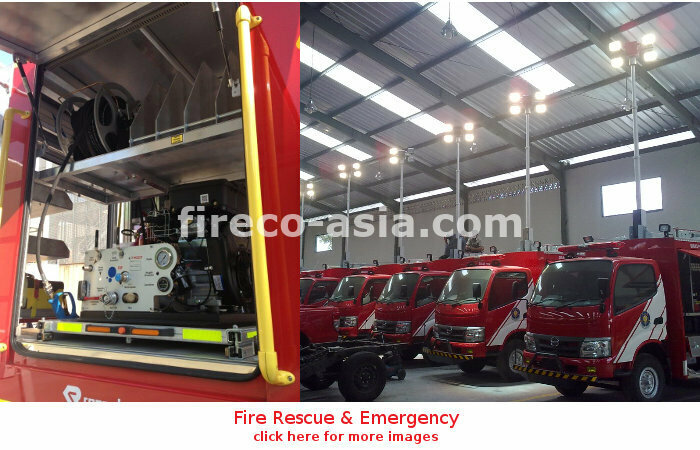 Aluminium Roller Shutter has been widely used on Fire Rescue & Emergency truck, as it gives the convenience and fast deployment of getting the rescue tools in the fire trucks. It also saves the space in the compartment of fire truck as the shutter door is rolled up when opening.